USA – Georgetown - Archaeologists at Tudor Place, an historic Georgetown estate with ties to George Washington, have unearthed artifacts that suggest the former existence of a dwelling for both enslaved and free workers on the site. A team of archaeologists spent several days in the past week painstakingly digging and sifting through layers of soil in the northeast corner of the Tudor Place garden. In a 2011 study, they uncovered similar artifacts pointing to domestic life, and Tudor Place consulted an 1863 map that suggested the location of an outbuilding in the area. And so they started digging. 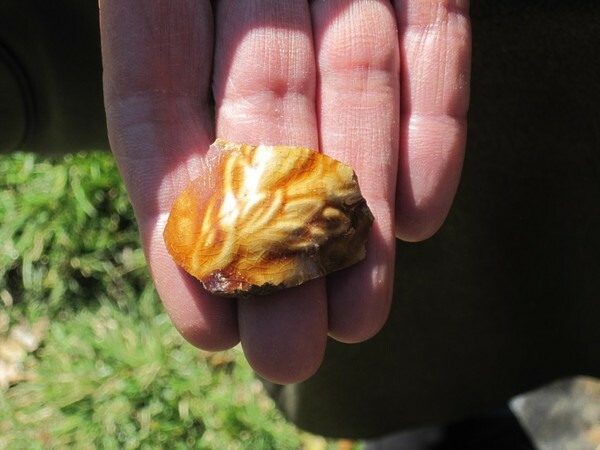 Wednesday they discovered a pit that was full of domestic artifacts, like oyster shells, ceramics and pieces of brick, all of which suggest there used to be some sort of structure there, Zullinger said. Looking at the items found so far, Zullinger estimated that they date back to the early 19th century. On Thursday, Zullinger told Patch, the archaeologists uncovered one of the more exciting finds so far: a large piece of Colonoware. Colonoware "is a type of rough ceramic known to have been made by African Americans from the end of the 17th century through the Civil War, and found from the Chesapeake region into the southern states along the East Coast. This is an extremely rare find in the district, and even highly unusual on this side of the Potomac," Zullinger explained in an email to Patch. FRANCE – Auch - Les archéologues ont sondé le sous-sol de la caserne Espagne. Ils ont découvert «la maison de force», où l'on enfermait les mendiants d'Auch à la fin du XVIIIe siècle. Les archéologues ont, en effet, vraisemblablement mis au jour les murs de la «maison de force» où l'on enfermait les mendiants d'Auch à la fin du XVIIIe siècle. Les recherches doivent le confirmer, mais les premiers coups de godets ont révélé des murs larges et très profonds (fondations de plusieurs mètres de profondeur). Cette prison était sortie de l'esprit des Auscitains, même des plus érudits. Or, le service «Pays d'Art et d'Histoire» du Grand Auch a retrouvé des plans dressés par les militaires au moment de la construction de la caserne, au début du XIXe siècle. Quelques détails de cette «maison de force» apparaissent, ce qui ne fait que renforcer l'intérêt scientifique de cette découverte. Une collaboration est ainsi engagée avec Fabien Ferrer-Joly, conservateur du musée des Jacobins. ARABIE SAOUDITE – La Mecque - The authorities in Saudi Arabia have begun dismantling some of the oldest sections of Islam's most important mosque as part of a highly controversial multi-billion pound expansion. Photographs obtained by The Independent reveal how workers with drills and mechanical diggers have started demolishing some Ottoman and Abbasid sections on the eastern side of the Masjid al-Haram in Mecca. The building, which is also known as the Grand Mosque, is the holiest site in Islam because it contains the Kaaba - the point to which all Muslims face when praying. The columns are the last remaining sections of the mosque which date back more than a few hundred years and form the inner perimeter on the outskirts of the white marble floor surrounding the Kaaba. The new photos, taken over the last few weeks, have caused alarm among archaeologists . Many of the Ottoman and Abbasid columns in Mecca were inscribed with intricate Arabic calligraphy marking the names of the Prophet Muhammad's companions and key moments in his life. One column which is believed to have been ripped down is supposed to mark the spot where Muslims believe Muhammad began his heavenly journey on a winged horse, which took him to Jerusalem and heaven in a single night. ROYAUME UNI – Amber Valley – An amateur treasure-hunter's find of more than 3,600 Roman coins has led to the discovery of an ancient home. Two members of the Derbyshire Archaeological Society became involved in excavating the site and found the 3,631 coins were in the middle of the room of a large Roman house. Mr Beard, of Sandbed Lane, Belper, said the coins he found ranged from the size of a lentil to the size of a modern penny. He said: "I was metal detecting in Amber Valley and in the first hole I found there were 500 coins." 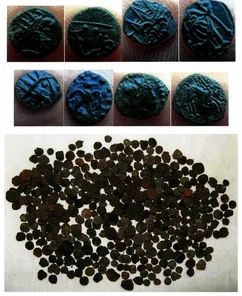 They are third-century coins of a 'barbarous' radiate. This name refers to the spiked crown of the emperor on the coin. According to a report from Eleanor Ghey, from The British Museum, they were produced locally and probably used to fill a gap in the official coin supply in Britain during the late third century.